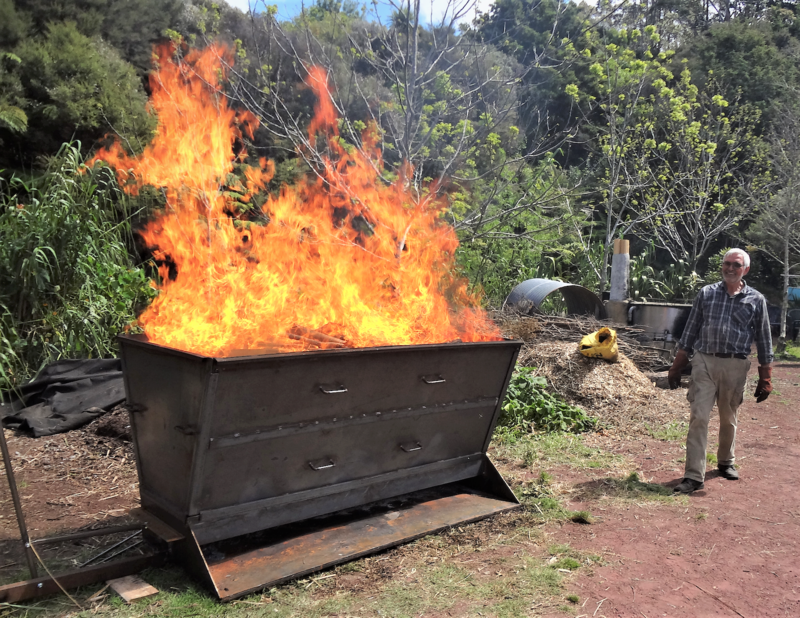 My interest in biochar developed after seeing the NZ government’s climate change projections (for example, see pages 49, 68, 105). We remain well on track for exceeding the IPCC’s worstcase scenario of RCP 8.5 (Representative Concentration Pathways are the four possible trajectories used in the 2014 IPCC report) and it seems advisable to plan for more droughts, more severe weather events, more severe tropical storms, and more heat. Since then the Drawdown site has put forward 100 ways to reduce atmospheric carbon. Biochar rates 72nd on this list with projections of 0.8 gigatons of carbon dioxide emissions by 2050. While I do not believe that biochar can make any significant difference to atmospheric CO2, I do think it could play a huge role in helping soils remain productive despite weather extremes. This is the aspect that most interests me – finding ways to feed people if weather conditions lead to the failure of industrial agriculture. Biochar holds onto nutrients, provides habitat for microbes and fungi, improves aeration and assists drainage while also holding onto water. It not only has the capacity to assist in obtaining a yield in very wet or dry years but also in maintaining soil microbiology and fertility. My first experiments were with TLUDs, as shown right. TLUDs taught me that dry hardwood burns the hottest and yields the most char – approximately one-third of a drum of char from a full drum of dry, large kindling size wood. Using hardwood, the burn lasted about 135 minutes before quenching. The middle picture is a TLUD made of 1.5 drums but I would not recommend it as handling an extremely hot, unwieldy drum is a recipe for major burns. The TLUD design on the right is my favourite simply because I enjoy the 40 glowing eyes as daylight fades (note the pot on the TLUD lid, stewing the meat and veg). Having found biochar was easy to make, I then mulched slightly damp char in combination with fresh shrub prunings through my 5HP Hanser chipper. 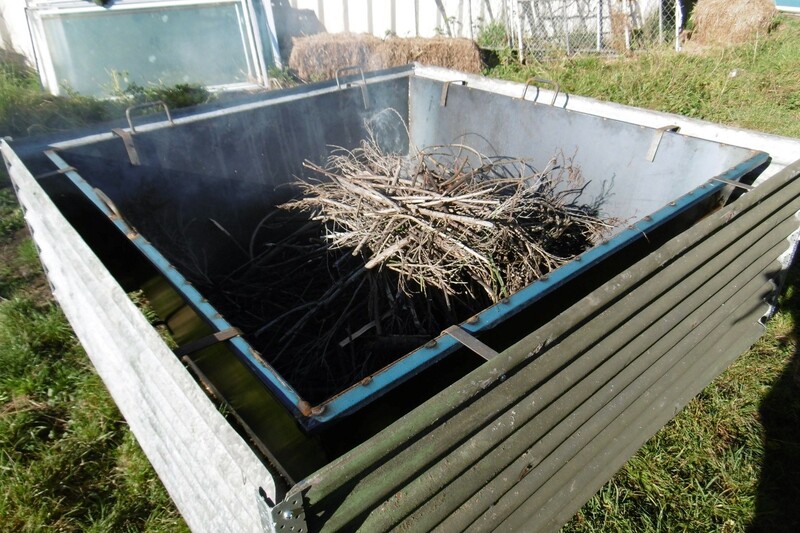 It worked beautifully, produced almost no dust and provided ready mixed ingredients for new compost heaps. Later, I wanted to make char on a continuous basis with simple technology. The design below that Klaus Lotz (of Permadynamics) and I came up with, works very well. When it is full, char can be shoveled from one of two opening vents in the base and more fuel added into the top. At 2.1m long, 1200mm wide, and 1200mm high, it produces a huge amount of heat which makes the heat shield essential, but the size also makes it perfect for loading with a frontend loader. Klaus notes that the imperfect seal of the two bottom vents actually assists in increasing the draft and charring of partially green wood. Note the two bathtubs of goat and cow slurry into which the char is shoveled to quench and charge it. The right photo is with heat shield and the lower photo, without the heat shield. 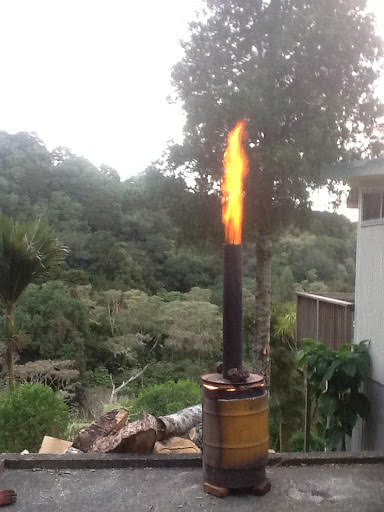 Burning bamboo without the heat shield. Bamboo must be one of the hottest burning fuels. An experiment that we never repeated. Note the handles – this was made so that the two ends, the base, & the two long panels on each side could be pulled apart for easy transport. 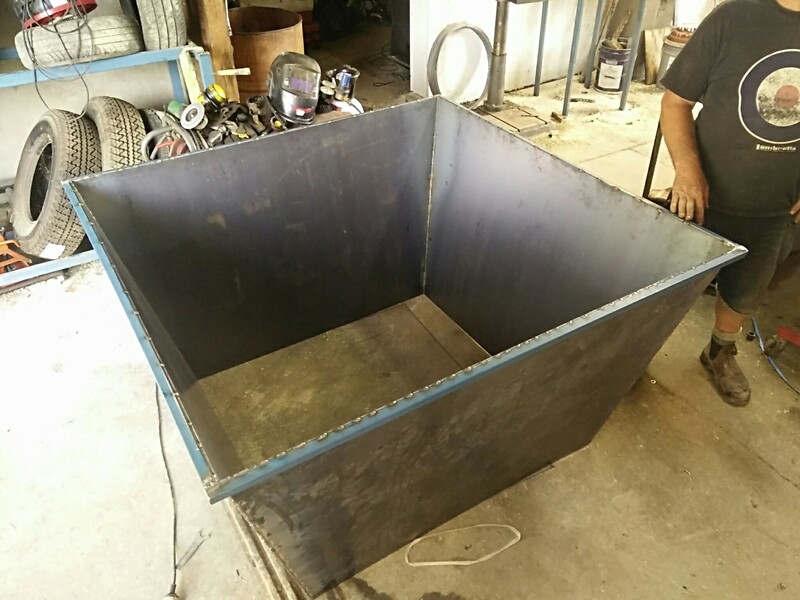 It worked well until extreme heat distorted the steel dramatically so later, it was welded as one solid unit. It’s still working well. This kiln is made from Cor-Ten steel plate which is rust and heat resistant . Quenching char at a Permadynamics workshop in Northland. 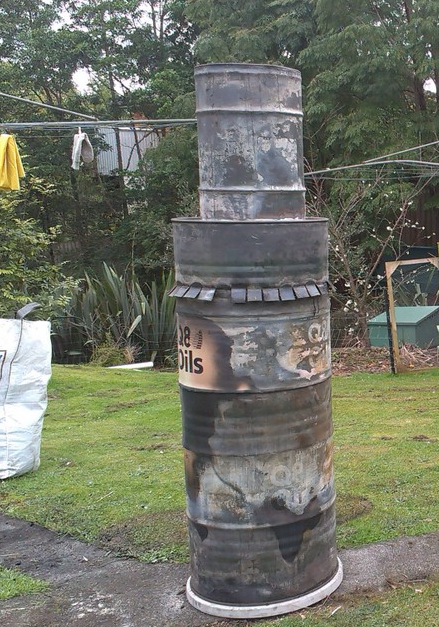 More recently we have been making char with an Oregon kiln made by Cam Mackay at Riverside Community near Motueka. Click the link for more information about Kelpie Wilson’s design. The pictures below show it new, with heat shield, in use, and quenching. The heat shield simply clips on and is said to improve the draft. The major benefit as far as I am concerned is that it dramatically reduces extreme radiant heat created when burning bamboo (as shown below). 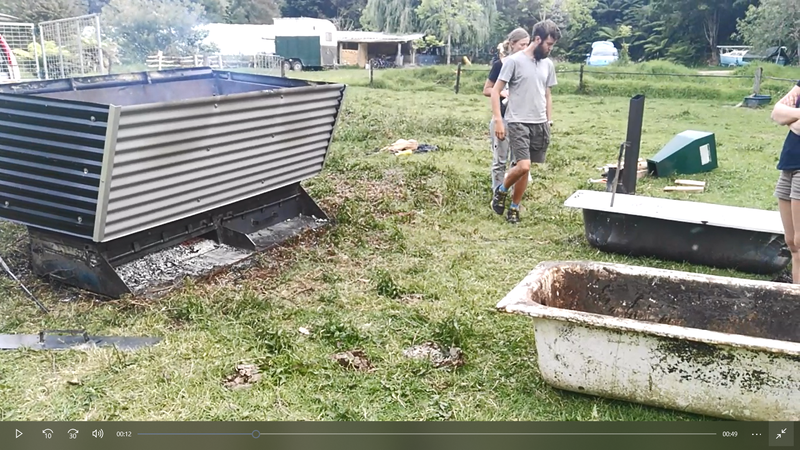 My biochar journey started with small-scale TLUD burns, then on to a larger continuous feed system, and now back to the medium-sized Oregon kiln which is easy and cheap to make, and easy to use and transport. In the future, I envisage using an Oregon kiln as designed by Kelpie Wilson which is only 600mm high and 1500mm square. My reason is that it is even lighter and easier to transport and use, and very easy to make and repair locally. In addition, I now gravitate towards systems with the simplest technology, requiring the least amount of movement of materials. I want to grow my fuel stock and char it right next to where it will be used. The next part of this absorbing biochar experiment is to create many and varied “islands” of diverse habitats which will not only meet the needs of plants, animals, birds, insects, microbes, and fungi, but which will also more sustainably feed, clothe, shelter, and warm us, and which will provide the feedstock for the onsite creation of char to make the soils ever more resilient in the face of climate change. Another hot bamboo burn. The old walnuts in the bottom left were charred using a 60-litre retort placed on top of the Oregon kiln. 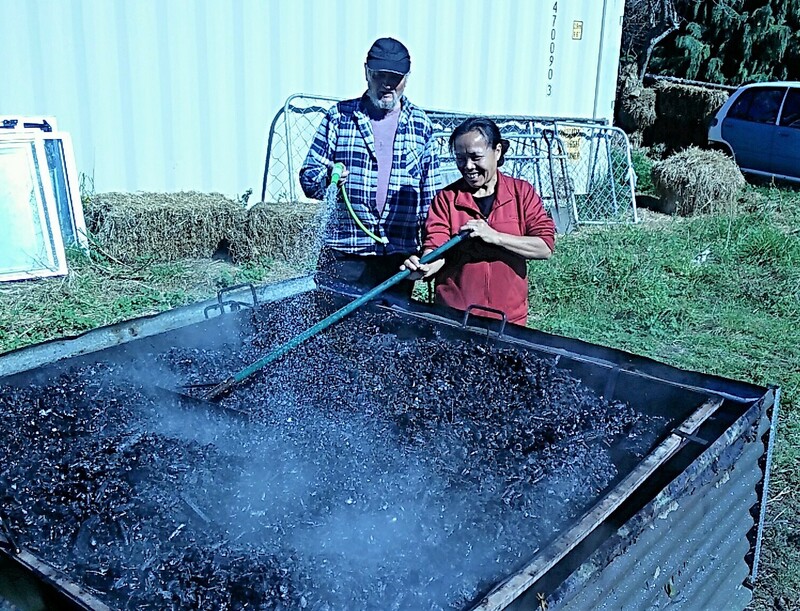 Klaus Wendlandt and wife, Beth (below) from Riverside Community quenching almost 2-cubic metres of biochar. 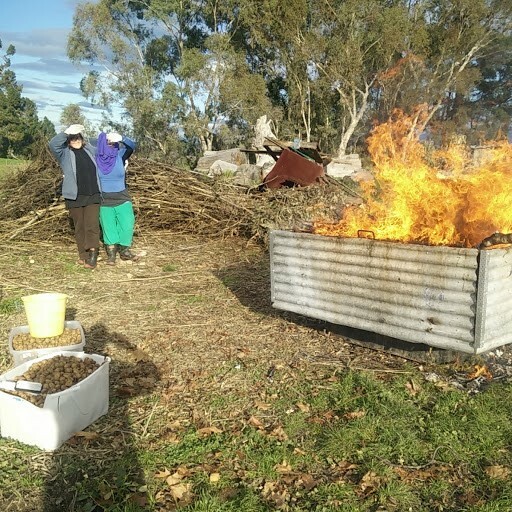 Our local biochar group, Carbon Action Aotearoa, is very active and anyone wanting more information can contact the CAA link.